Diana is desperate to prove herself to her warrior sisters. But when the opportunity comes, she throws away her chance at glory and breaks Amazon law to save a mere mortal, Alia Keralis. With this single heroic act, Diana may have just doomed the world. 5 Words: What is a hero anyway? Right from the start I knew I would enjoy this. Why? I loved how canon lore was covered in the story. 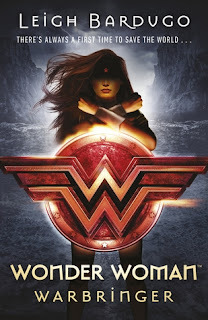 There were no info dumps, no random expositions dropped into the prose, but the background and history of the characters and Themyscira was woven into the writing and it was exquisite. I already knew the WHY and the HOW but this would be a perfect introduction to the world if you were unfamiliar. You dance differently when you know you won't live forever. I loved Diana's voice too. She is the first character we meet and her determination and huge heart made my own heart sing. I loved how she feels so under appreciated and that she's not good enough and that's so relatable. But the she has this tenacity, her will to prove herself to everyone around her, driving her on. Alia's storyline broke my heart a little. She, like Diana, feels under-appreciated but still has a huge heart. Although both are far from normal, they felt familiar to read. I think everyone has had similar doubts in their own self-worth. Both characters prove that they are better than what everyone around them thinks. They stick it up to the haters, prove to themselves that yes, they can do it. It was empowering to read. The only thing I didn't like was how Diana and Jason interacted. It always felt on the cusp of going somewhere I really didn't want it to. Overall this was fantastic. The writing was beautiful and I fell in love with most of the characters. I loved how the idea of what makes someone a hero was explored. I imagine all wars look the same to those who die in them. I loved this and it just made me even more excited to pick up my own copy of Warbringer!I've also never read anything by Leigh Bardugo so I'm very excited now to pick it up! Oh it's so fab! With every new book I fall more in love with her writing. I have been wanting to watch the newly released Wonder Woman film for ages but I didn't realise that there was a book! I love reading before viewing because then I can create the images of the characters in my head rather than being informed by the film! This sounds like a great read, just a shame about that character relationship! I'm not a big superhero fan, but I think I might have to read this after your review! It sounds amazing. Oooh, this sounds like such a great read, and those quotes you highlighted really resonated with me. I adore Wonder Woman! Will have to check this one out :). Aren't the red edges so lovely? I didn't know there was a book! I watched the film and loved it, but honestly had no idea there was a book. Well I need to read that then! I will admit to not really being a fan of this genre, but you make it sound soooo good!